Half the storefronts are empty in Chambers, Ohio. Abandoned steel mills stand as silent monuments to a past that will never return. Two brothers, Kent and Adam Austin, work in two of the biggest industries that remain in the town – high school football and bail bonds. Their careers, like most everything else in their lives, were defined the night someone kidnapped and murdered their sister when the three of them were in high school. The brothers have hardly spoken during the 22 years since their sister was taken. Kent is a local hero, a winning football coach and a man of faith, who talks of God and family to murderers in his prison ministry. Adam drinks too much, aches for revenge, and lives so close to the Chambers criminal element that differences often blur. A man who calls himself “the prophet” slips into town. His passion is murder and something more: “Bring him the hopeful and he will leave them hopeless. Bring him the strong and he will leave them broken. Bring him the full and he will leave them empty.” When a 17 year old girl is murdered, one whose faith Kent had tried to nurture, both brothers understand that that the killing is personal. Someone has come to town to rip the old wound open and threaten them with new ones. Michael Koryta (pronounced koo-ree-ta) decided he wanted to be a crime novelist at the age of 16. While still in high school he interned with a private detective. His first novel, Tonight I Said Goodbye (2004) won the St. Martin’s Press/PWA Best First Novel prize before he was 21. He had four more crime novels under his belt when he took a stunning turn by injecting supernatural elements into his thriller, So Cold the River (2010), which I reviewed here http://wp.me/pYql4-8W. He followed this up with two more books in the same vein, The Cypress House http://wp.me/pYql4-xF and The Ridge in 2011. The Prophet has no overt ghosts, though people are haunted, and Adam regularly talks with his dead sister. The prophet is flesh and blood, but his menace lurks in every shadow. The “un-natural” and the “super-natural” are so “natural” in Michael Koryta’s novels that his evil terrifies more than it does in most horror stories. We never know much about the killer, but we do see, in his memory, his methodical method of stalking and killing a bird when he was 11. That’s enough to make him more chilling than Count Dracula. 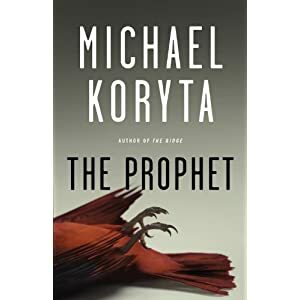 In crossing genre boundaries at will, Koryta’s new book delves deeper into the 21st century human condition than mystery and horror novels usually do. A chill wind blows through this rust belt town, under gray and threatening skies, as well meaning men and women find redemption and renewal elusive – and yet, heroism, loyalty, faith, and family all matter. As the high school football players learn, you get back on your feet and back into the line because there is nothing else you can do. There are very, very few authors whose books I will buy they day they come out. There are few books these days that I find I cannot put down. Once again, Michael Koryta did not disappoint. I downloaded The Prophet the morning it came on line and put everything else on hold until I had finished. You may well find yourself doing the same. This entry was posted in Authors, Book Reviews, Books, Characters, ghosts, Novels and tagged authors, book reviews, books, fictional characters, ghosts, Michael Koryta, Novels. Bookmark the permalink. Thank you very much! I really appreciate the encouragement.